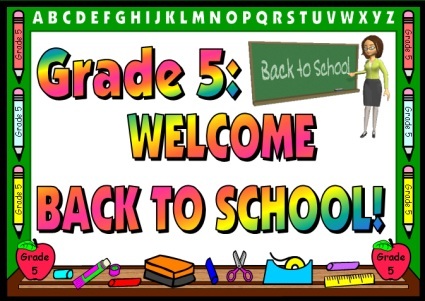 This five page banner is included for free in this set of Back to School worksheets. Click on the Add to Cart button above to purchase this set of printable worksheets. 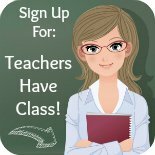 These Back To School worksheets will be emailed to you and then you can download them instantly. 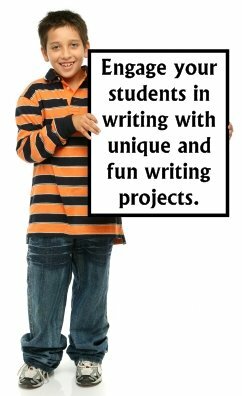 Chalkboard Writing Templates: Are you looking for a unique idea for a creative writing assignment and bulletin board display that you can use with your students during the first week of school? 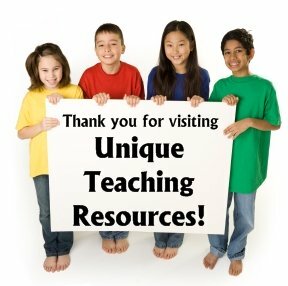 Are you also looking for a Back to School teaching resources set that is customized to the grade level that you teach? This is a generic creative writing template that contains no topic, so you can choose the topic that you want your students to write about. This assignment will not take your students very long to complete. 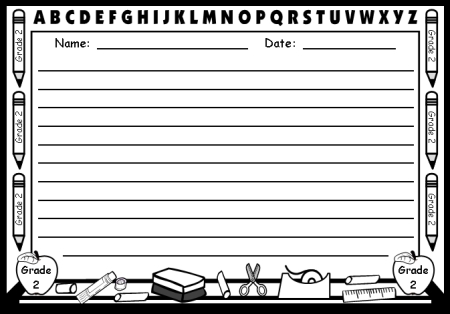 The chalkboard writing templates are on one printable worksheet and they are easy to cut out. 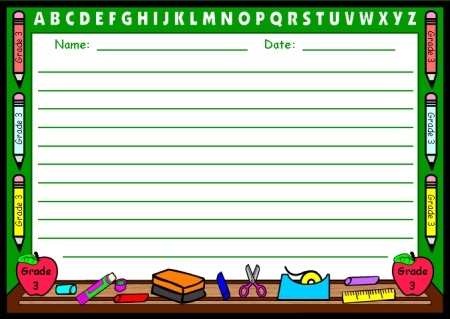 These chalkboard writing templates measure 9.5 inches in width and 6.5 inches in height. 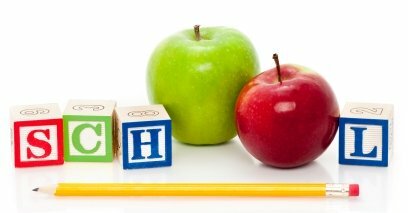 This quick Back to School creative writing assignment will provide you with student work samples that you can post on your bulletin board immediately. The colorful matching bulletin board display banner and additional chalkboard accent pieces will help you to design an eye catching bulletin board display during the first week of school. Below is an example of the Grade 1 first draft creative writing worksheet. There are 4 apples on this worksheet that contain Grade 1 written on them. included in this set of Back to School worksheets. Below is an example of the Grade 2 final draft black and white template. There are 6 pencils and 2 apples on this worksheet that contain Grade 2 written on them. 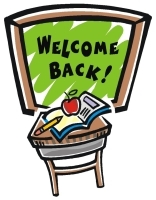 included in this set of Back to School printable worksheets. Below is an example of the Grade 3 final draft color chalkboard template. also included in this set of Back to School printable worksheets. 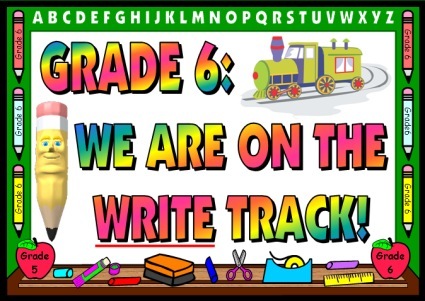 This time is valuable and better spent on developing your classroom curriculum and grading papers, so I have designed a matching 5 page banner for your Back to School bulletin board display. 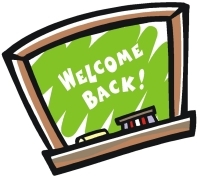 If you have access to a laminating machine, you can laminate your banner so that it is durable and you can use it year after year for bulletin board displays of these Back to School chalkboard writing templates. is a general banner that is not specific to any particular grade level. 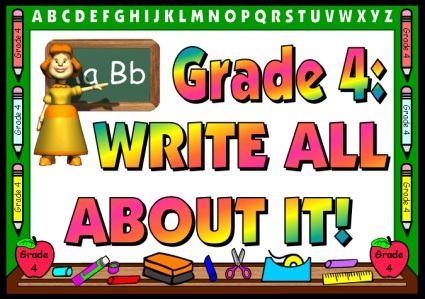 This Back to School bulletin board display banner can be used by all grade levels. also includes separate banners for Grades 1 - 8. Above is an example of the Grade 3 banner. Grade 3 is written inside the two chalkboards, 4 pencils, and 2 apples. Above is an example of the Grade 7 banner. The banners for Grades 1, 2, 4, 5, 6, and 8 are not shown. I have included 4 chalkboard accent pieces in this set of teaching resources. These 4 chalkboard accent pieces are also grade specific. Below are examples of these accent pieces with different grade levels written on them. Grades 1, 2, 3, 5, 6, 7, and 8 examples are not shown. Grades 1, 2, 3, 4, 6, 7, and 8 examples are not shown. Grades 1, 2, 3, 4, 5, 7, and 8 examples are not shown. Grades 1, 2, 3, 4, 5, 6, and 8 examples are not shown. 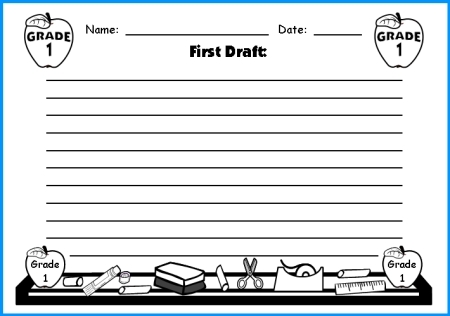 I hope that this set of Back To School printable worksheets that I have designed to be grade level specific helps you to have a writing assignment that is targeted to the grade level that you teach. The specific grade level banners and accent pieces are designed to help you quickly create a colorful bulletin board display that is also targeted for the grade level that you teach. Although you will only use one set of these grade level resources this year, be sure to save the entire set of chalkboard writing templates and banners to use for the future. As teachers, we are often switching the grades that we teach and you can use this same creative writing idea with the other grade levels that you teach in the future. 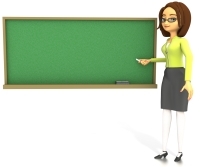 Thank you for visiting my Chalkboard Writing Templates page.